15.11.2016 Strasbourg - Georgian First Deputy Foreign Minister David Zalkaliani met Secretary General of the Council of Europe Thorbjørn Jagland. Discussions focused on the existing co-operation between Georgia and the Council of Europe, on the October Parliamentary Elections in Georgia. The Secretary General positively assessed the elections and congratulated the Georgian side on the successful elections. Thorbjørn Jagland reaffirmed unequivocal support of the Council of Europe for Georgia’s sovereignty and territorial integrity and underlined that Georgia will always be on the political agenda of the Council of Europe. Thorbjørn Jagland also noted that the Council of Europe will continue presenting the consolidated report on the conflict in Georgia. 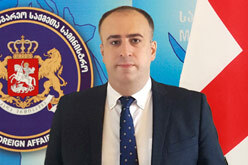 David Zalkaliani put particular emphasis on the heavy humanitarian situation in Georgia’s occupied territories and thanked Thorbjørn Jagland for the efforts of the Council of Europe to monitor human rights situation in Georgia’s occupied regions.